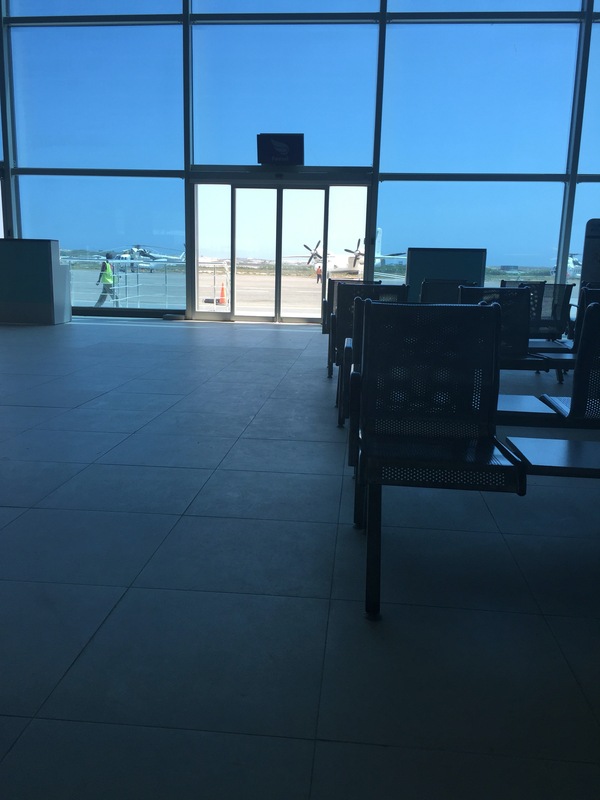 I know it’s a tad in-contiguous to write about leaving Mogadishu before I chronicle our activities in Somalia, but I jotted notes on my phone and wanted to share my impressions while they were fresh. This was written in the airport and on the plane using the notes feature of my iPhone. Today was probably the most challenging of our time in Somalia. I’ve become more aware of our guide/”fixer” having more interest in his business affairs and his personal life than our comfort. As isn’t uncommon in more rustic destinations, if we don’t have exact change we can forget seeing our remaining money, despite promises otherwise. But he delivered on showing us what we came to see and our security detail did their job. This morning, we got up and had breakfast intending to leave for the airport at 9 a.m. Our fixer arrives late, provides our souvenirs (and no change). Then he announces our 1:30 flight has been moved to 11 am (and yesterday he implied the flights are overbooked and we may be turned away at the gate). So in the equivalent of a Third World hurry we hop in the truck and bring with us a Somali fellow also headed to the airport. It is our last time leaving via the hotel’s security measures and we zig zag up the route to the airport. The airport is 10 minutes away, very close to the UN compound. We approach, walls beside us to protect from suicide bombs, barricades and barbed wire. Traffic chaos as everyone tries to reach the chute that leads to the airport. It takes 30 minutes to get to the first checkpoint. Ugandan peacekeepers and local security ask for our passports, gaze at our white faces, greet “good morning,” scan the car for bombs. One official wants our bags removed from our possession. I believe our staff protests that we don’t have time for that and they want to get the Americans to their flight. The bags are returned to the truck. Two of our hotel security detail have left the truck and watch cars around us, passersby and the scene in general. I’m starting to know them: the skinny one with the full goatee, the badass looking one with his big shiny sunglasses. Heavy military vehicles roll by one after another. It’s 10 a.m. and we weave to the final checkpoint, a boom arm that blocks the road in front of the actual airport. The Ugandan peacekeeper in his camo and sleek pink sunglasses waves us toward the end of terminal. A local gendarme without firearm directs us to the parking lot. After ten minutes of banter in Somali, we leave the car and walk to the terminal. We arrive at the airport. 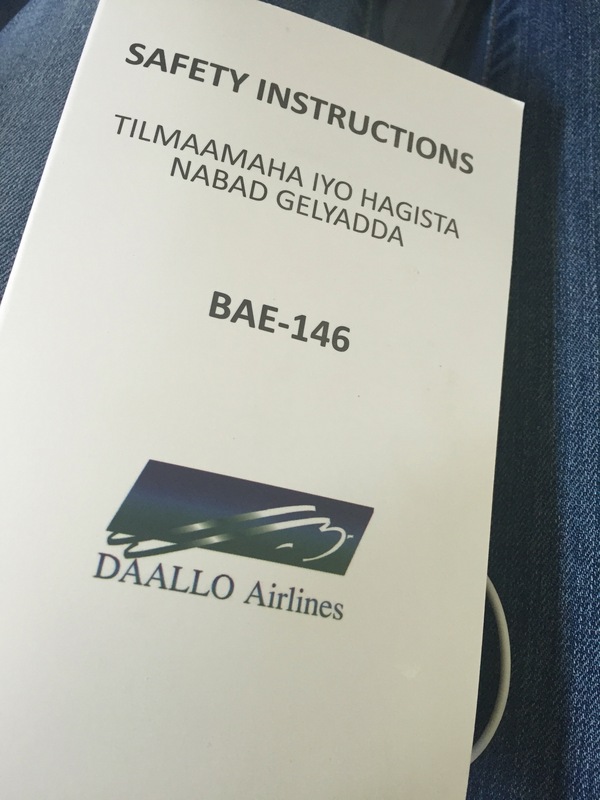 One of my souvenirs from Djibouti raises an eyebrow at security. I knew exactly why they wanted me to open my suitcase. It’s a gift I bought for my husband. We have to go to the ticket counter for a stamp on our e-ticket. We go to check in. We go to another desk where they match our names and passports to what looks like the flight manifest. We go to immigration, probably the quickest part of the process. Ladies in robes and head coverings check our passports and tickets again. A second round of security. Finally the gate. Keep in mind, the international departure area of the airport is probably the size of a small elementary school gym. And all of this has happened before the departure gates. At the gate, the bathroom has no water, no soap and at least a functional toilet but no paper, spray or other creative method to cleanse oneself. M asked about smoking, and one of the staff brought him outside to smoke and back in. At the gate, surrounded by windows, one watches the planes arrive. Then the staff comes through screaming airline names & destination cities. They give everybody about five minutes. The plane arrived, a British jet or something with flight attendants that might be Ukranian or Russian. Unlike the ones on the flight down that acted like they were being punished doing a routine between Jedah, Djibouti and Mogadishu. The aircraft smelled like someone had been smoking– we’re guessing the pilots. This is a direct flight, flight time 1 hour 40 minutes. 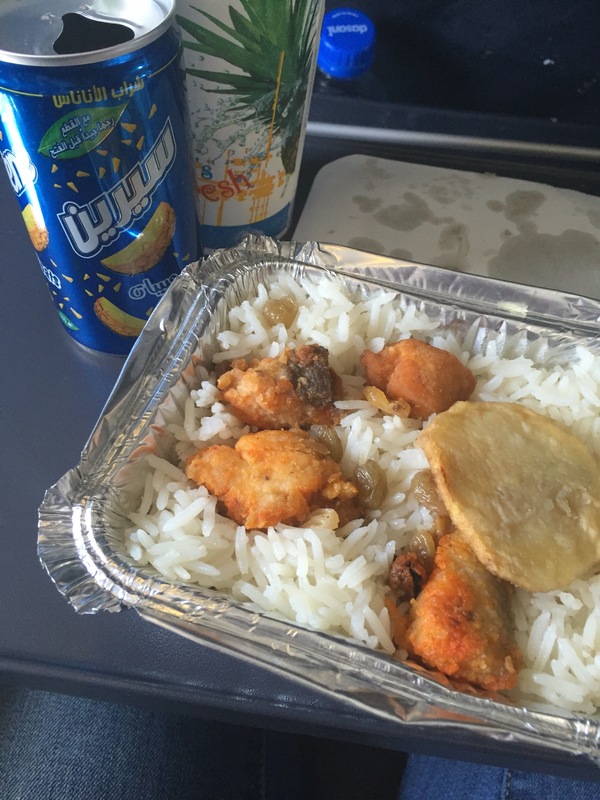 Meal service was water or pineapple juice and fish with Somali style rice. The flight attendants keep running in and out of the cockpit. The flight attendant is spraying air freshener neurotically because someone is indeed smoking in the cockpit.